Even Fox News had this ridiculous video (link) on this gun. 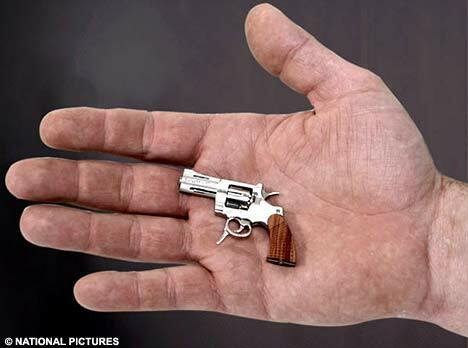 Ok, so in less sensational terms this tiny rimfire gun fires 2.34mm bullets at 440 fps and costs between $5,952.00 for the basic model, and up to $59,529.00 dollars for the extravagant 18 caret gold and diamond encrusted version. Lets compare that to some common Daisy BB guns. The projectile from this gun could probably pentrate the skin if it was pressed directly against someone, but I’ll bet dollars to doughnuts that it wouldn’t even penetrate simple clothing from a distance of two feet, although it may leave a nasty welt on your skin. A small pocket knife or a 25 cent sharpened number 02 pencil would probably be a more formidable weapon than this hilarious collectors item.